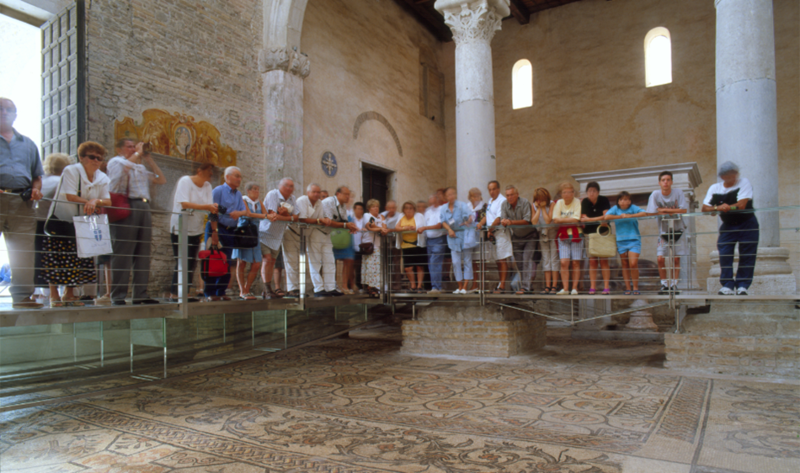 The floor mosaics in the Basilica of Aquileia – among the most spectacular created by the Western Christianity – are one of the best preserved examples of this form of art in the Western world. 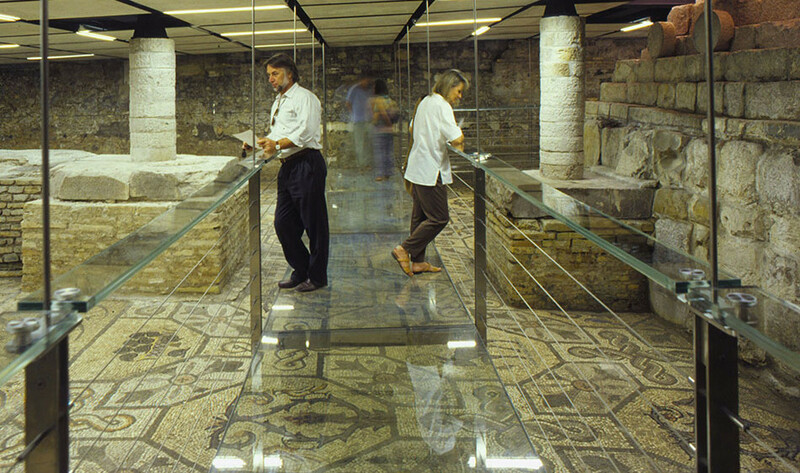 The mosaics, which date back to the 4th century AD, cover an area of about 700 square meters, making them part of an impressive artistic heritage site which is inscribed in the UNESCO World Heritage List. The constant stress to which the mosaics are subject due to the passage of visitors (more than half a million a year) led the Society for the preservation of the Basilica to submit a project for preserving and protecting the mosaics without disrupting visits. Architect Ottavio di Blasi was asked to do so without temporarily closing the Basilica, and to replace the dilapidated reinforced concrete roof of the ancient Theodore’s hall. 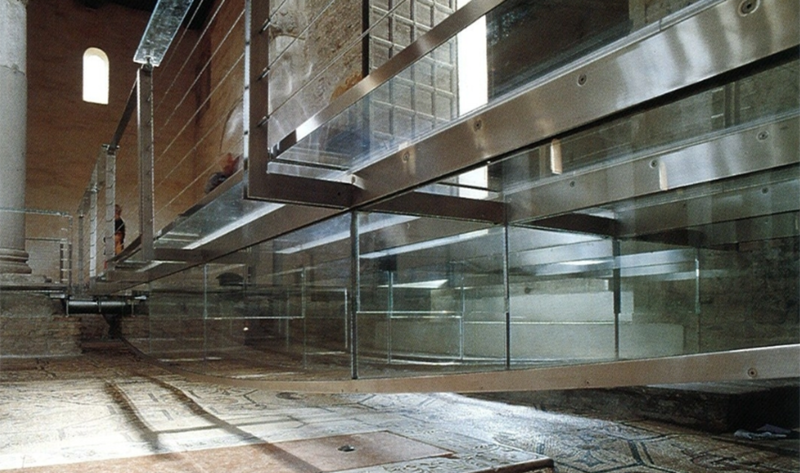 The project included the creation of a new system of glass walkways suspended at one meter from the mosaic floor, which is at the same height of the old medieval stone floor of the Basilica. Utmost care was put in preserving the inside of the Basilica, so the system was designed and constructed so as to be removed at any time without leaving any sign. The path is divided into two different parts depending on the shape and the specific technical requirements. The first part passes longitudinally through the entire Basilica, running along the left and right columns; the stainless steel structure is directly anchored to the base of the columns, which emerged after removing the medieval floor. By the main entrance, visitors can admire the mosaics by looking from the balustrades of a 16-metre glass bridge suspended over the central nave. The second part follows the walls of the adjacent hall. In this case, the structure of the frame hangs from the new ceiling slab. Hooks are hidden by the stone false ceiling. The tempered, laminated structural glass panels (12 mm thick) rest on the steel frame. Other chemically tempered glass panels, which are only 3 mm thick, have been put over the main load-bearing panels, and can be replaced every two years. The extra clear glass used ensures high transparency and load resistance of 5 kN/sq. m. The thin stainless steel frame can resist permanent and variable loads, while vertical bracings are made of glass.